When it comes to children’s parties, parents often feel the need to really impress not only their child, but all the other children and their parents who attend. Recent years have seen children’s parties continue to become increasingly expensive and extravagant, when in reality, so long as most kids have fun, they’ll be happy. A great way to really inject some fun into a party is to hold a good old fashioned traditional party where all the children take part in active physical games rather than sitting in front of a TV. There are plenty of ideas for parties of this type that are sure to get your party going well. Creating a happy atmosphere at a party can be as simple as playing some great music to get the kids excited and then organising a game to get them moving around and thinking. Traditional games such as musical chairs, musical statues or pass the parcel can be fun and can be played by a large group of children. For musical statues, someone needs to be in charge of the music and should play it to the group. The group then have to dance around until the music is stopped and at this point they have to freeze in whatever position they’re in. The first person to move is out and the game continues until there’s only one person left standing. At this point it’s nice to give that child a little gift, even if it’s only a small bag of sweets or some balloons. Another great musical game is musical chairs. Set up chairs in a line for each child at the party, then remove one so there’s one less chair than there is children. Start the music and get the children to walk around or dance around the chairs. When the music stops, they have to be the quickest to sit on the chairs and whoever is left without a chair is out. Continue this each round until there’s two children vying for one chair. Whoever manages to sit on it in the last round is the winner. Again you can give the child a prize if you like and it’s normally nice to see them rewarded for their effort. Pass the parcel is a perennial favourite at children’s parties because it means that someone other than the birthday girl or boy also gets a present and kids love that. Group all the children together in a circle and hand one of them a parcel that has been wrapped up with at least 10 sheets of paper. Start the music and get the kids to pass the parcel to each other around in the circle. When the music stops, the child who holds the parcel gets to peel off a layer of the paper. Eventually the parcel will be unwrapped and the child who has it on the last unwrapping is the winner of the prize inside. 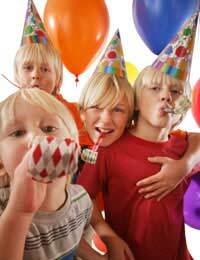 Some of the best children’s party games involve simple ideas that can make them laugh. Games like pin the tail on the donkey, Chinese whispers and hide and seek, give the kids something to giggle over and don’t require too much planning. To play pin-the-tail-on-the-donkey, simply put up a large poster of a donkey on a wall. If you want to be more modern, put up a cool cartoon character or even a favourite movie character. Get the children to line up and give each of them a ‘tail’ with a pin in it. When it is their turn, put a blindfold on them, spin them around three times and then try and get them to pin the tail on the donkey in the right spot. The winner of the game is whatever child is closest to the correct part of the donkey. Chinese whispers involves all the children sitting in a circle and you whisper one phrase into a child’s ear. This phrase then has to be whispered all the way around the circle and by the end the child who has to say it out loud normally gets it completely wrong! If they get it right, they win a prize along with the child who started the whisper. If you don’t mind children running around your house, you can allow them free reign to play hide and seek. Make sure that each child gets the turn to be the seeker and give the children who don’t get caught a time limit to be found, otherwise you may find yourself there all day! Hide and seek can keep children occupied for hours, especially if you have a large home and garden, so it’ll give you the chance to organise some other games or food and entertainment. One of the most common traditional entertainers for children’s parties is of course a clown. If you want to hire an entertainer for your birthday party, that’s fine, you can do that easily by seeking out children’s entertainers in the Yellow Pages. You could also consider hiring a magician if you don’t think your child would enjoy a traditional clown. Children love to be wowed and amazed so anyone who can combine both would be ideal. Traditionally there are other entertainers you can hire also. You could hire a musical act, an act that involves performing animals or even something unusual like a traditional mobile farm where the animals come to your home. There are no shortage of fun children’s entertainers out there, so look around and ask other people for their advice. Word of mouth is usually the best form of finding out whether someone will be perfect for your party.